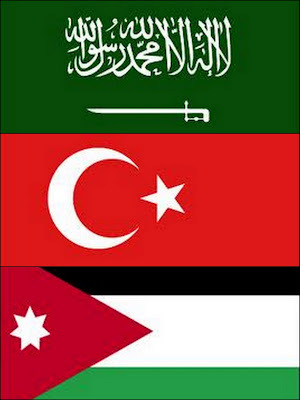 It’s time Saudi Arabia, Turkey and Jordan intervened militarily to end the Syria crisis. Why shouldn’t they when the situation there is getting worse by the day? They don’t need a Security Council resolution under Chapter VII of the UN Charter. During the Jordanian-Palestinian war of September 1970, Hafez Assad massed his troops along the border with Jordan without a Security Council resolution. Turkey too moved her troops to the Syrian border in October 1998, and threatened to invade Syria over its embrace of the Kurdistan Workers Party (PKK) and its leader Abdullah Ocalan. Turkish tanks were set to cross the borders into Aleppo without waiting for a Security Council resolution. Look at the proposed tripartite military intervention as a limited regional campaign like so many others. What could happen, a Russian intrusion? Impossible. Yes, the Russians would be furious and protesting. But the United States and the West would stand up for Saudi Arabia and Turkey, and at the minimum prevent blatant involvement by the Russians. It would be a brisk and incisive campaign that would leave no time for the Russians to even airlift fresh arms supplies to the regime. Iran, on the other hand, would never enter a full-scale war to save Bashar al-Assad. It would surely be foaming at the mouth. Some of its men would fight alongside the regime and perish with it. But Iran won’t be foolhardy as to invade Bahrain or Kuwait for instance in retaliation to joint Arab-Turkish intervention to help out the Syrian people. Without bona fide intervention, the Syria crisis would carry on for years. Lines have been drawn in the sand. There are no key figures left to carry out a palace coup or defect but hasn’t yet. Any Saudi or Turkish military analyst must recognize that the regime is winning as many points as it is losing. The regime has regained control of Douma and Darayya on the outskirts of Damascus. It has made up its mind and committed not to treat residents there as people it sought to win back but as enemies whose back it wants to break. The last few days bear witness to the summary execution of hundreds of residents in townships vacated by the Free Syrian Army (FSA). We’ve seen images of countless bodies of victims with hands tied behind their backs and gunshot wounds to the head. The people summarily executed were not FSA insurgents whose military strategy is to hit and run back to the rural areas. The victims were civilian inhabitants who tolerated the presence of FSA fighters in their townships. Opposition sources say the summary executions by regime forces did not distinguish between FSA sympathizers and people who had stayed put at home. Before us is an example of the type of civil or liberation wars that “devour their own people” and peoples close by. Who can say the Syrian liberation war won’t last as long as the Algerian liberation war, or that the Syrian civil war won’t last 15 years such as the Lebanese civil war? Are Saudi Arabia and Turkey ready to tolerate decade-long and wide-ranging hostilities on their doorsteps liable to lead to Syria’s partition and regional intercessions, let alone spillovers – into Lebanon, for instance? The agreed wisdom is they are not. Conventional wisdom also posits that a blitz is a must-have. A thrust by the Saudi and Jordanian armies advancing into southern Syria and a push by the Turkish army into northern Syria would secure quick gains. In the south, Deraa and Houran would be liberated within hours. Concurrently, Turkish forces would have moved into Aleppo in the north. Citizens would rush out to the streets to welcome their fraternal saviors. The regime’s armed forces would be in a state of shock and awe. The next question would be when to move toward Damascus, which would already be within easy reach of Saudi and Jordanian forces. Any military expert would tell you the Syrian army is seriously overstretched. Its supply lines are faltering. Its morale is low and it is hardly able to ward off FSA fighters. Saudi Arabia could also assemble a bigger Arab striking force by co-opting contingents from Morocco, the UAE, Qatar and maybe Egypt. President Mohamed Morsi is already on record saying he wanted to help out his brothers in Syria. But the concern is of the Syrian regime resorting, when on its deathbed, to “Option Zero” – namely the use of missiles armed with chemical warheads, including nerve agents. We’re not intervening. The free Syrians are fighting and are ready to die for their freedom. So let’s suffice with supporting the FSA. This has been our position for a year. We could not help the Syrians win their battle. We were reluctant to arm them. Some of us feared the arms would find their way into the wrong hands, specifically al-Qaeda. We are trying to determine the extremists and moderates Syrian armed opposition ranks. But by hesitating, we are promoting extremism and driving the Syrian insurgents who are being bombed by regime warplanes into the arms of al-Qaeda and its bigots. This is not to mention also that the idea of jihad in Syria is bound to draw into the battle Arab recruits, Saudis included. We have to do something short of total war and beyond sending arms and communications equipment to the FSA. A surgical airstrike against the chemical and biological weapons facilities is a good idea. It won’t only rid the regime of such a ghastly weapon, but deal it a mortal blow and pave the way for our rapid intervention. The costs of civil strife in Syria dragging on for years far exceed the costs of a rapid intervention to end the crisis within days, notwithstanding the risks involved. The regime’s sectarian army is exhausted, horrid and wobbly. It’s time someone dealt it the coup de grâce for the sake of the region, the Syrian people and the additional 5,000 Syrians who will be killed in September and each month thereafter. Indeed that’s the average monthly death toll in Syria until we see Arab and Turkish troops being greeted by Syrians packing Marjeh Square and waving Syria’s independence flag.